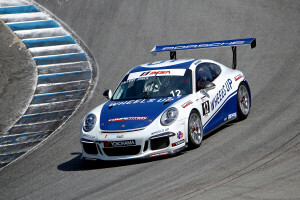 Monterey, California – After leading from the green flag to the checkers in race one of the IMSA Porsche GT3 Cup USA by Yokohama at Mazda Raceway Laguna Seca, Michael Lewis added a repeat encore performance in race two for Competition Motorsports on Sunday with another textbook drive to secure his second win in the category only a few hours after taking his first. Adding to the team driver suit dry cleaning bill was the champagne spray of fellow Competition Motorsports driver Fred Poordad, who won the Gold Class in race two as he backed up his run to fifth in class in the first race of the day as well as netting the “Hard Charger” honors for his in-race upward mobility. 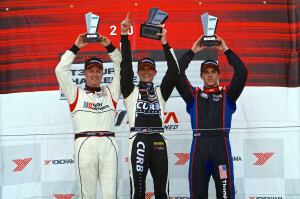 Joining the podium ceremonies after the race was David Calvert-Jones, who netted a Masters Podium result with his fourth place overall finish. 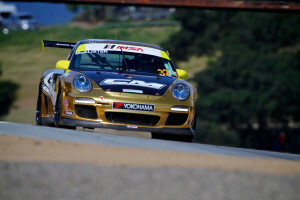 Not to be outdone, the rest of the Competition Motorsports team brought home solid results as Blair Chang scored his second best result of the year so far with a run to sixth place in the Gold Class, while Mike McAlister impressed in his IMSA debut with his eighth place Gold Class result. 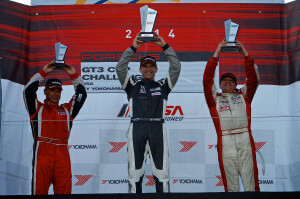 With new Yokohama tires providing increased grip, the second race gave all five Competition Motorsports entries the ability to drive their Porsche 911 machines to the limit all the way to the checkered flag and improve their starting positions. The second race also featured fewer cautions and a lot of side-by-side green racing action. Notably in just his second IMSA race, Michael McAlister gained three positions from the start to bring the car home in eighth place. Competition Motorsports will be back in action at Lime Rock Park on May 23-24.